If you’re looking for play therapy techniques for autism, we’re sharing the 4 most common types of play therapy for children with autism, 11 of our favorite therapy games for children, as well as 8 of the best play therapy toys for kids with special needs below. But before we get to all of that, let’s take a closer look at play therapy – what is it, how does it work, and what play therapy techniques for autism are most effective? Kids use play to learn a variety of skills as they grow and develop. Engaging in regular play develops fine and gross motor skills, encourages creativity, problem-solving, and cognitive thinking skills, helps build a child’s independence, develops social and language skills, and offers lots of emotional and behavioral benefits. Play can also help boost a child’s self-esteem, reduce feelings of anxiety, develop relationships with their peers, and develop appropriate self-regulation and self-control. Play therapy is a type of counseling geared toward children, and as the name suggests, it uses play to communicate with kids to help prevent and resolve psychosocial issues and challenges. It can also be used to diagnose or determine the cause of any disturbed behavior a child might exhibit, and help them work through anxiety, trauma, etc. Play therapy works by allowing ‘free play’ or ‘unstructured play’ sessions whereby children naturally expose their vulnerabilities and anxieties. A play therapist will observe the child playing with various therapy toys and note any recurring themes that may stem from trauma or anxiety. They can then guide the child in therapeutic activities to help them deal with whatever issues they may be facing. They may also utilize a more directive approach to play therapy to help children relearn or change troubling behaviors through the language of symbolic play. Play therapy goals are all about helping kids gain greater awareness of their feelings and teaching them how to express themselves in positive ways. It can help children manage their anger, improve their self-control, and help empower them. It can also help manage fear, anxiety, and depression, as well as enhance a child’s problem-solving skills. Is Play Therapy for Children with Autism Effective? Yes. Children with autism typically engage in play slightly differently than their neurotypical peers. They tend to prefer independent and/or parallel play, focus on repetitive activities, and struggle to identify and interact with those around them, making play therapy a great tool to help parents and caregivers identify with a child on the autism spectrum. By focusing on their unique interests and obsessions, play therapy techniques for autism are designed to help draw a child out of his or her shell and help him or her communicate with and relate more easily to others. Non-Directive Play Therapy. Also referred to as ‘child-centered play therapy’, this non-intrusive approach allows the child to communicate his or her thoughts and feelings through play without any input or direction from others. The onus is on the therapist to enter the child’s world and gain insight into their thoughts and emotions, as well as their understanding of the world around them. Directive Play Therapy. Therapists play a much bigger role in directive play therapy by initiating certain types of play, redirecting conversations, etc. This type of therapy can be helpful to kids on the autism spectrum who get stuck in repetitive behaviors and/or who struggle to communicate and socialize with others, but it can be harder to maintain a child’s attention for long periods of time with this type of approach. There are many different types of play therapy techniques for autism that can be used, but therapists tend to focus on the following 4 types of play therapy when working with children on the spectrum. Floortime Therapy. As the name suggests, Floortime Therapy requires the therapist and/or parent to physically get down onto the floor to play with the child for 2-5 hours per day. These child-led sessions are focused on activities the child enjoys, and have been shown to drastically improve parent-child relationships while simultaneously improving the child’s ability to engage in back-and-forth play as well as developing his or her complex, two-way communication, emotional thinking, and self-regulation. The book, Engaging Autism by Stanley Greenspan is a great introduction into the concepts behind Floortime Therapy. PLAY Project. Founded by Dr. Richard Soloman, the PLAY Project (Play and Language for Autistic Youngsters) is an intensive, evidence-based developmental intervention for families with young children on the autism spectrum. The program is based on the DIR (Developmental, Individualized, Relationship-based) theory of Stanley Greenspan, MD and Serena Weider, PhD, and through trained consultations, it teaches parents effective, fun, and useful PLAY techniques to help improve daily interactions with their child. The program aims at developing a child’s self-regulation, intimacy with others, two-way communication, complex language and communication skills, and emotional thinking, and is a great compliment to ABA therapy. Find out more about Dr. Soloman and his PLAY Project approach as it relates to autism via his book Autism: The Potential Within. Integrated Play Groups. Also referred to as IPGs, Integrated Play Groups are different from more traditional social skills groups in that they are focused on collaborative play with neurotypical children rather than therapist-directed activities with other children on the autism spectrum. For example, an IPG group could be compromised of 4 children – 2 with autism, and 2 without. The idea is for the children to meet up 2 times per week over a 12-week period, providing them ways to improve their social, communication, pretend play, and self-regulation skills. Child-Led Play. Directed play therapy can be challenging, particularly among children with more severe autism as the parent/therapist needs to find a way to captivate the child’s interest while simultaneously helping to draw them out of their shell so they don’t get ‘stuck’ in repetitive behaviors. Sometimes a more open-ended, child-led approach is best, and while it can take longer to see significant gains with child-led play, this type of play therapy has been shown to improve social and communication skills in children with severe autism. If you’re looking for the best play therapy toys, you probably already have a bunch lying around your house, most of which will naturally support whichever play therapy techniques for autism you’ve chosen to focus on. Remember that your goal is to connect and engage with your child, so try to focus on toys your child enjoys. ‘Pretend play’ toys are a great option as they allow you to engage with your child naturally. As you are playing, you can tell your child the name of different objects and ask her to repeat them back to you, ask questions about the toys, role play, etc. These types of toys also provide ways for kids to practice their fine motor skills and learn how to play with their peers, making them a win-win. Here are 10 ideas to consider. The best play therapy toys are those that offer opportunities to work on multiple skills at once, and this set by Melissa and Doug does exactly that. While working on your child’s fine motor and hand-eye coordination skills, you can also engage with her and teach her letter recognition and work on her vocabulary skills, making this toy an all around win! If your child struggles with balance and coordination, this is a fun play therapy toy to try. You can use it outside or inside, making it a great way for kids to blow off some steam on bad weather days, and it can withstand up to 200 lbs, so you can take turns showing off your balancing skills as a family. Once your child masters how to balance on the board, find other ways to incorporate this into her play to help further improve her gross motor skills. For example, you may have her balance on the board while playing a game of catch. Whether you’ve chosen to focus on one or more particular play therapy techniques for autism, or you just want some therapy games to use at home with your child, try not to get too hung up on the TYPE of games you are investing in. While the internet is filled with suggestions on the therapy games for children, your main goal is to find a way to connect with and engage with your child so you can cross over into their world and find ways to help them develop whatever goals you’ve set forth. There are tons of games available that double as fabulous therapy games for children, and we’re sharing 11 ideas below that provide ways to play with and connect with your child while naturally helping them work on and develop other skills. If your child struggles with hand-eye coordination, this bean-bag inspired therapy game offers a great way to practice his or her throwing skills. Start small with a little free-throw practice, and then move the ‘turtle’ farther away and ask your child to throw to specific targets. Practice tossing, catching, and bouncing with your child with this super fun trampoline paddle ball therapy game! This is a great gross motor activity the whole family will enjoy, and it doubles as a fabulous way to improve a child’s hand-eye coordination. While I’m not really one to recommend electronic therapy games for children, the Osmo system has really captured my heart. It teaches so many important concepts, like letters and numbers, in a fun and creative way, and if you’re looking for visual motor activities that teach problem solving skills, the Tangram game is one of my absolute favorites! While the more traditional form of Simon Says, where kids are actively following gross motor movements (‘Simon says stand on one leg’, ‘Simon says do 3 jumping jacks’, ‘Simon says hop like a bunny’, etc.) is preferred, the electronic version of Simon says is also a beneficial therapy game if you’re looking for something you can do together with your child. It requires kids to follow directions and pay attention to sequencing, and I like that it provides a way to help sensory sensitive kids tolerate noise. This game is equal parts hilarious and educational, and can be enjoyed in the classroom or as a family. Players take turns drawing number cards and must remember the growing sequence of numbers until a player pulls a ‘distraction card’. This person must then answer a silly question before reciting the sequence of numbers in the exact order they were drawn. It’s so much fun and it’s one of my favorite therapy games for children as it simultaneously helps develop their cognitive skills in a non-threatening way. Whether you’re just starting to educate yourself on the different play therapy techniques for autism to help your child, or you’re looking for the best play therapy toys and therapy games for children to help keep your sessions fresh and engaging, I hope this collection of tips and ideas proves useful to you. Remember to choose toys and games that capture your child’s attention, and to worry less about building skills and more about connecting and having fun with your little one, and on the days you feel hopeless and frustrated, remember that change doesn’t happen overnight. It takes consistency, dedication, and ongoing commitment from parents, therapists, and teachers! Enter into children’s play and you will find the place where their minds, hearts, and souls meet. 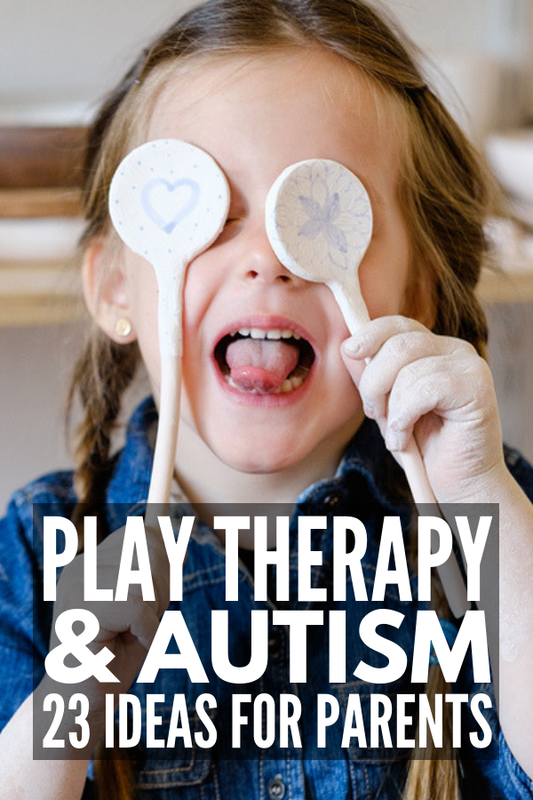 If you found this collection of different play therapy techniques for autism, as well as the therapy toys and games shared in this post helpful, please share this on Pinterest! And if you’re looking for more tips and tricks to help your child with autism, please follow our Special Needs Parenting board, where we share all kinds of great ideas we find each day!